Circus of the World is currently working on the next Clowns Without Borders fundraiser. It is entitled Bring Back Joy and will be an interactive circus extravaganza held at Trapeze School New York, Washington DC on August 9th, 2015. This event will include indoor and outdoor performances, activities for all, snacks and drinks, and more. Don't miss out! For details, head to the Circus of the World website. 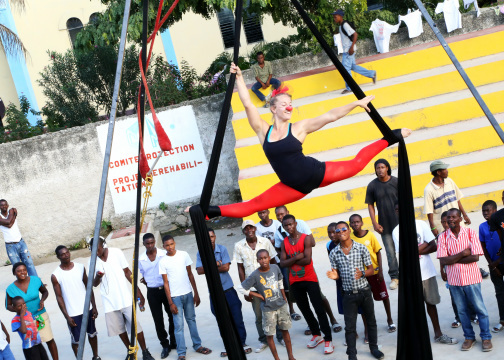 Last November, Circus of the World completed a two week performing tour in Haiti! Working with Clowns Without Borders, we managed to spread joy and circus to over 1,000 Haitians. This is the first time an aerial rig has been a part of a CWB tour and it was an amazing addition to the trip. Most Haitians had never seen anything like it and gazed up in awe at our aerial antics. To read more about the experience, click here, and go to the CWB site for more info on the project. We are working on the next aerial trip with CWB and will be throwing another fundraiser soon.